MuséoParc Alésia in Burgundy, France. The new orientation center is on the right and reconstructed sections of Roman fortifications are on the left. 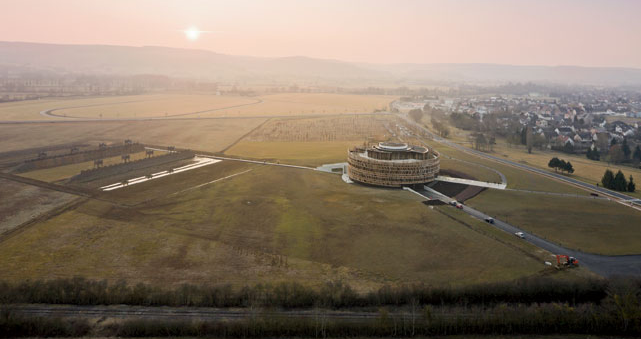 On the site in Burgundy, France where Julius Caesar laid siege to Gallic leader Vercingetorix, architect Bernard Tschumi of New York created a circular concrete orientation center wrapped in a wood lattice on the site occupied by the Roman army. (Although Napoleon II erected a 22 foot tall statue of Vercingetorix in 1865, he doesn’t seem to have caught on as a celebrity and no one names their kids after him.) Called MuseoParc Alesia, the design of the interpretation center echoes the ringed fortifications built by Julius Caesar in 52 BC. The building not only interprets the site through the exhibits inside but emphasizes views out onto the historic landscape via the windows and balconies that circle the building. After watching a film about the battle, visitors exit the auditorium onto the tree-shaded roof terrace to enjoy a panoramic view so that, “vous vivez une expérience au cours de laquelle vous allez comprendre l’histoire de ce site, apprendre à regarder les signes dans le paysage mais aussi partager un lieu, un moment, un récit.” And it includes an innovation for French museums: a “toy library” for children ages 3 to 8 where they can learn while having fun (I think we call this a discovery room in the U. S.). Strangely, the architect wanted the lobby to be empty. I wonder if visitors will find this a confusing and sterile experience after encountering this dramatic building outside? Seems to me to be a bit jarring, but I guess I’ll have to go to Burgundy to find out for myself. A second circular museum built in the brick Gaul style will be located about a half mile away. You’ll find a slide show of images at Architectural Record and initial reviews on Trip Advisor look promising. Thanks to Barbara Campagna for alerting me to this new building! This entry was posted in Uncategorized on July 17, 2012 by Max van Balgooy. This Visitor Center is fantastic! Really, it’s amazing that no one ever named their offspring Vercingetorix. The panoramic view, and the opportunity to contemplate the landscape while sharing a place and narrative is the same goal we had in mind when I worked with the City of Fort Collins, Co. to interpret the Lindenmeier Archaeological Site – a ~12,000 year old Folsom Complex site that was later inhabited by tribes, homesteaders and ranchers. There’s not much to see – an arroyo where excavations happened 90 years before. But the story of a landscape that people have returned to again and again for thousands of years is a powerful one. So we created multiple opportunities for reflection and contemplation; inviting visitors to see how they belonged to the same narrative of place. What a beautiful space. I suspect a trip to France is in order. Thanks for letting me know about the Lindenmeier Archaeological Site. I had never heard of this before and I’ll check it out! Thanks! You helped me figure out why those comic book characters had such crazy names.